I just wanted to say this first: you know that this is a road trip book and not to mention the fact that Rosie had a chance to go with THREE guys for this getaway...it literally made me scream with excitement. But please lower your expectation. I always have a thing for road trip. There is something special about it and it is like my siren's song that I cannot resist. Besides all the wonderful sightseeing, there's always a self discovery or a lesson to be learn. I don't really know but somehow being on the road will temporary help you forget about your problem. It will give you more time to relax and to think about your life and what you want. 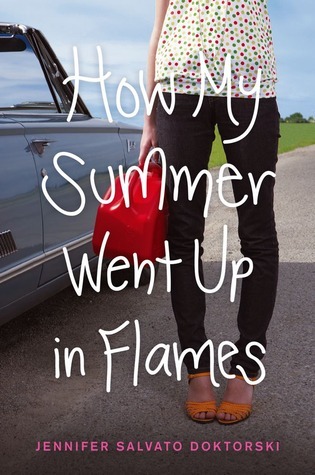 How My Summer Went Up in Flames is sort of like that. The trip helped Rosie to realize what is important and how her obsession with her ex became too much out of the line and how it affected people around her and herself. I admitted that Rosie had annoyed me few times. First I just don't get how she can be so obsessive with her ex to the point of being a stalker. It's first love and she got her heart broken but still I think she's overacted. Secondly when Rosie tried to escape, AGH she really is good at making me mad. Thirdly, Rosie is just so selfish and mindless to the point of unbelievable and not to mention her anger problem. However I am glad that she'd changed and became more mature at the end of the book. The three nerdy guys are cute and so understandable. I just love them all. One more thing though I just don't buy it you know, how in the world Rossie's parents think to let their teenager daughter going on a road trip with three guys. It's just somehow not real you know. I have had it in my TBR list for a while now, but you helped me decide!